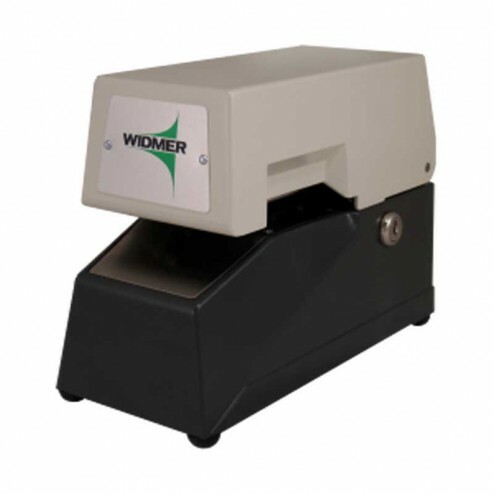 The Widmer T-RSU-3 Automatic Time Stamp saves time and money. Time stamp is versatile, featuring high quality, clean crisp imprints. It is compact and offers a wide variety of desirable features. This unique, modern time stamp features a distinctive two tone, light and dark gray finish that will complement the decor of any office. Instant trigger operation you just insert the paper. Quick ribbon change no mess. A new, open throat and finger indent case feature allows for a greater accessibility; documents of letter size or small tickets can be inserted with ease. The depth of the throat can be adjusted to allow a selection of imprint locations. Stamping pressure can be electronically increased when needed to penetrate through multi-part carbon and non carbon forms. Inscriptions can be both above and below the time and date.